Our works extends from overviews of proteomics in metazoan to novel studies that have employed a proteomics-based approach. Our research is working on expression proteomics (proteome, phosphoproteome and glycoproteome) and functional proteomics studies in several biological subjects by 2-D gel-based. We are focusing on crustacean (shrimp and crab) innate immunity via each hemocytes (blood cells) cell type after pathogen infection. Gel-based proteomics and proteomics-based approach are utilized to understand the roles of immune-related proteins and peptides in host defense mechanism response. We aims to discover the effective and sustainable way to protect the shrimps from pathogen infection especially viral infection. In addition, besides animals, we are also focusing on the comparative proteome profiling of plants (eg. para rubber tree) to investigate immune-responsive proteins in several tissues including rubber latex during fungal infection and screening for antifungal proteins. 1. 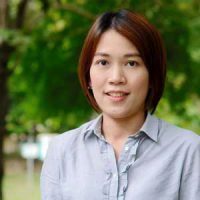 Taengchaiyaphum, S., Havanapan, PO., Roytrakul, S., Lo, CF., Sritunyalucksana, K., Krittanai, C. Phosphorylation is required for myosin regulatory light chain (PmMRLC) to control yellow head virus infection in shrimp hemocytes. Fish Shellfish Immunol. 2013. 34:1042-1049. 2. Havanapan, PO., Thongboonkerd, V. Are protease inhibitors required for gel-based proteomics of kidney and urine? J. Proteome Res. 2009. 8:3109-3117. 3. Havanapan, PO., Kanlaya, R., Bourchookarn, A., Krittanai, C., Thongboonkerd V. C-terminal hemocyanin from hemocytes of Penaeus vannamei interacts with ERK1/2 and undergoes serine phosphorylation. J. Proteome Res. 2009. 8:2476-2483. 4. Bourchookarn, A., Havanapan, PO., Thongboonkerd, V., Krittanai, C. Proteomic Analysis of Altered Proteins in Lymphoid Organ of Yellow Head Virus Infected Penaeus monodon. Biochem. Biophys. Acta 2008. 1784:504-511. 5. Chongsatja, PO., Bourchookarn, A., Lo, CF., Thongboonkerd, V, Krittanai, C. Proteomic analysis of differentially expressed proteins in Penaeus vannamei hemocytes upon Taura syndrome virus infection. Proteomics. 2007. 7(19):3592-601.